I got annoyed looking for the right tyre in the printed out 2011 catalog. So, I did what any IT geek would do... Firstly I printed the .PDF using XPS document printer, then ran it through Document Imaging OCR to create a text file. 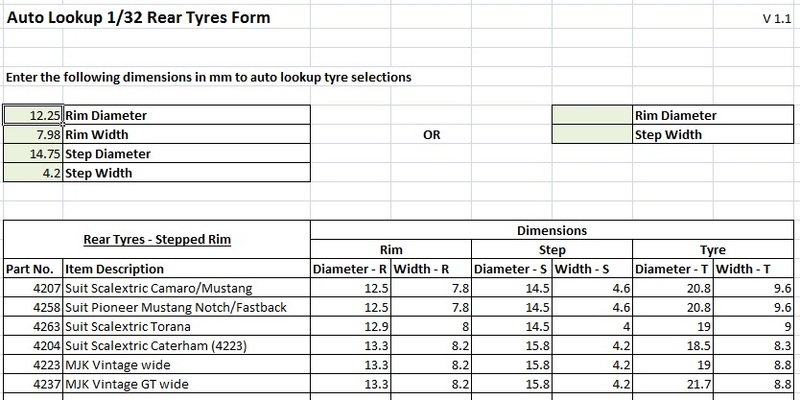 Then I re-formatted it to a .CSV file, which allow me to make myself an excel spreadsheet with all of the MJK tyres in it. edit: You will need to enable macros for the auto lookup to work. Edited by shadow_rusty, 31 January 2018 - 09:17 AM. Nice work. There have been quite a few added since 2011, but not sure how many. I have been trying to match up some new alloy rims and tyres for my DBR9 and tyres to suit so that I get the same end result, what a mission this will definitely help with that process. Thanks again you busy boy you. Armchair have the most up to date list that I know of. Or you could email the MJK boys, tell them what you've done and ask them for the missing information. I know they've released tyres for the Torana and SCX 'Cuda since the 2011 list was done. I'm sure there were others in 2012 as well. That's always a possibility. And while you're at it, ask them when the XB tyres are due out. I put in 14 rim dia and 8.5 step and nothing appears in the table although this is the dims for the vanquish on tab2 of the spreadsheet. Yes I have check autocalc is on. ignore above, sorry to all for lack of reading ability. Edited by ZeGas, 28 February 2013 - 09:55 PM. Do you have macros enabled? Edited by shadow_rusty, 28 February 2013 - 10:06 PM. I'll blame Bill Gates or his successor. Glad I could inspire you to achieve such great things but, the link won't open for me here at work, all I get is "code". Thanks for your time in doing this and keeping it updated S.R. Been meaning to ask, can the tabs be copied and still stay live, I have tried but they loose the formulas. I want to copy each tab so that I have it set up for each car. It's not a biggie as I can use the original and copy once I have the data imputed. Just a Q of curiosity really. Yeah, The only VB I understand has a tab on top not the bottom.